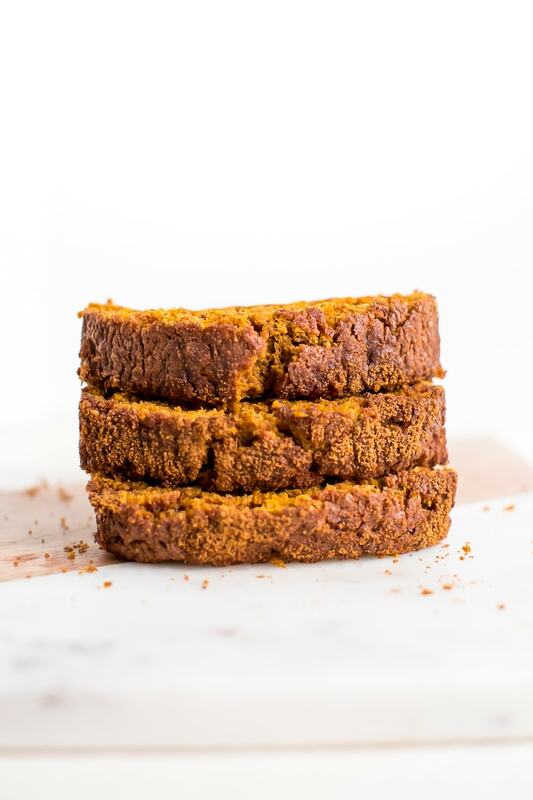 Sweetened only with maple syrup, this delicious healthy low sugar pumpkin bread is made with whole wheat flour and it’s vegan! If there’s one thing I love making during the fall months it’s pumpkin bread! 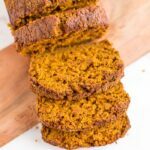 It’s loaded with pumpkin flavor, spices and tastes so good with a cup of hot coffee on a crisp fall morning. That said, most pumpkin breads are far from being a health food. 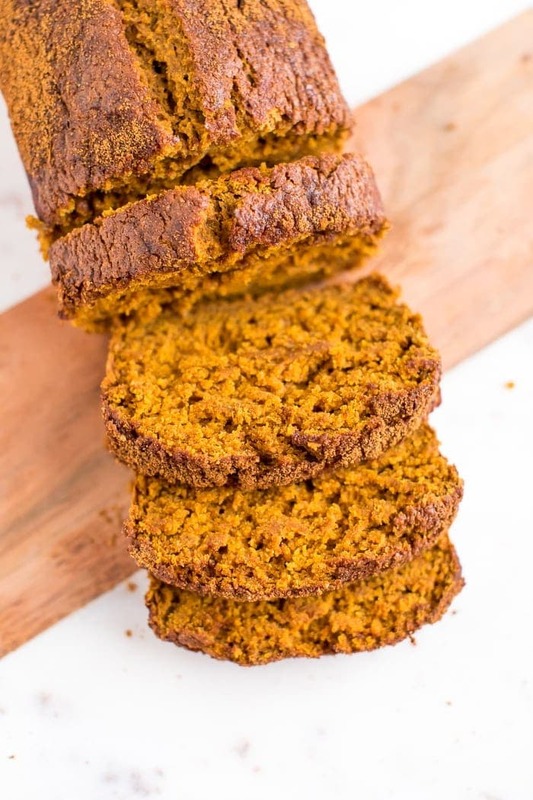 They’re loaded with sugar and lack fiber so I set out to create a pumpkin bread recipe that’s lower in sugar and made with a higher-fiber flour, but still tasty and satisfying. And I finally found it! This recipe calls for whole wheat pastry flour, which offers a lighter texture than regular whole wheat, only 1/4 cup of maple syrup for the whole batch and if you use a flaxseed egg, it’s totally vegan too. The whole wheat pastry flour works better than regular whole wheat flour if you’re looking for the light and fluffy bread that regular all-purpose flour provides. If you can’t find whole wheat pastry flour you can also use white whole wheat flour or 1 cup all-purpose and 2/3 cup regular whole wheat. The coconut sugar and cinnamon topping does add a bit of sugar to the recipe so if you’re really look to keep sugar in check you can omit the topping, but it’s pretty darn tasty and makes for a pretty crust on top of the bread so I wouldn’t recommend skipping it. I am honestly so excited with how great this bread turned out — it took several test batches to finally land on this recipe but it’s perfect. The bread is moist, fluffy, flavorful and not too sweet. Perfect for breakfast or mid-day snacking. I love putting a slice in our toaster oven (the actual oven part, not the bread slot) to reheat and topping it with a little nut butter. Such a good combo! 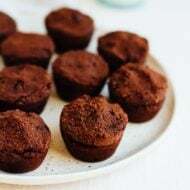 And if you’re gluten-free or grain-free I have a couple other pumpkin bread options for you — these flourless pumpkin muffins (they’re made with almond butter and SO amazing) along with this quinoa flour pumpkin bread with chocolate chips. It’s so hearty, plus pumpkin and chocolate is basically the best combo ever! 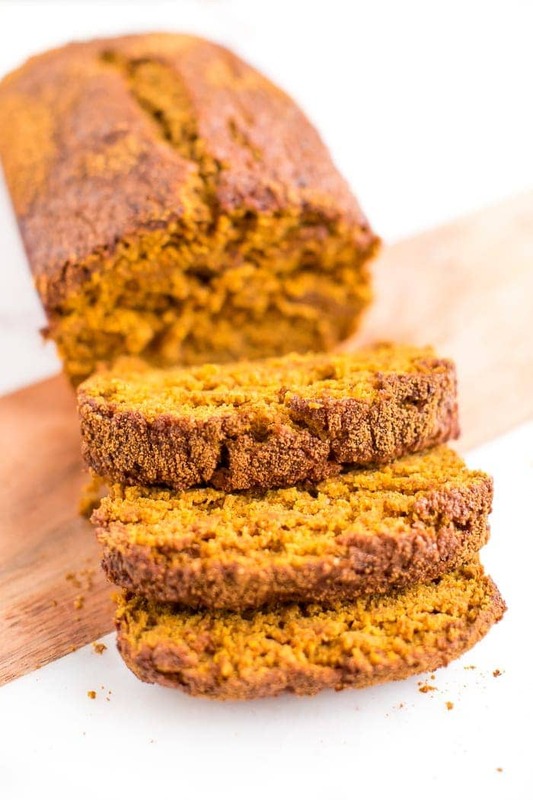 If you make this low sugar pumpkin bread be sure to leave a comment and star rating below. 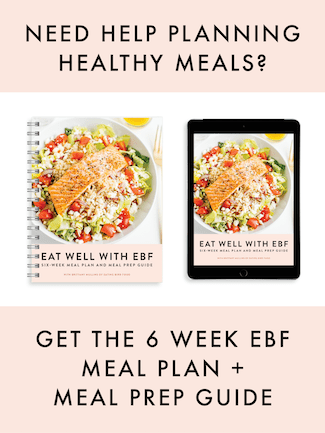 Your feedback means the world to me and is so helpful for other EBF readers who are thinking about making the recipe. Preheat oven to 350° F. Prepare 1 regular sized loaf pan (8.5 X 2.5 X 2) by spraying it with cooking spray. Whisk together ground flaxseed with water in a small bowl with a fork and let it sit for a few minutes until an gel like consistency forms. In a large bowl, combine the dry ingredients (flour, baking powder, baking soda, cinnamon pumpkin pie spice and salt). Combine the wet ingredients (pumpkin, maple syrup, vanilla, oil, apple sauce and flax egg) in a medium-sized mixing bowl and blend well. Add the liquid mixture to the dry and stir well. In a small bowl mix coconut sugar and cinnamon for the topping. Pour batter into the loaf pan and top with coconut sugar cinnamon topping and place on the center rack of oven. Bake for 60 minutes or until a toothpick inserted in the middle comes out clean. For a sweeter pumpkin bread, feel free to use 1/2 cup maple syrup. A regular egg can be used in place of the flax egg if you don’t need the recipe to be vegan. I love perfect fall weekends like that. Both recipes look fantastic! Ooooh, two recipes in one post?! Niiiice! That pumpkin bread looks delicious! Both of those recipes look great! 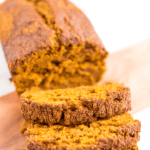 Can’t wait to try the pumpkin bread – thanks for the recipe! Sounds like a great Saturday…and the perfect fall day! The recipes deserve flagging for sure, i’m SO excited to start cooking for the holidays! YUm! those recipes look amazing! Thank you for posting I can’t wait to give them a try! Looks like a fun weekend! Thank you for sharing those recipes! Both sound amazing and look delicious! Catching up with old friends is awesome – especially if it is a tradition that you guys do each year! Oh, and I think jello shooters can totally pull off the sophistication card! Making similar quinoa for lunch now! thanks for the inspiration! Thanks for the bread recipe. It looks great! 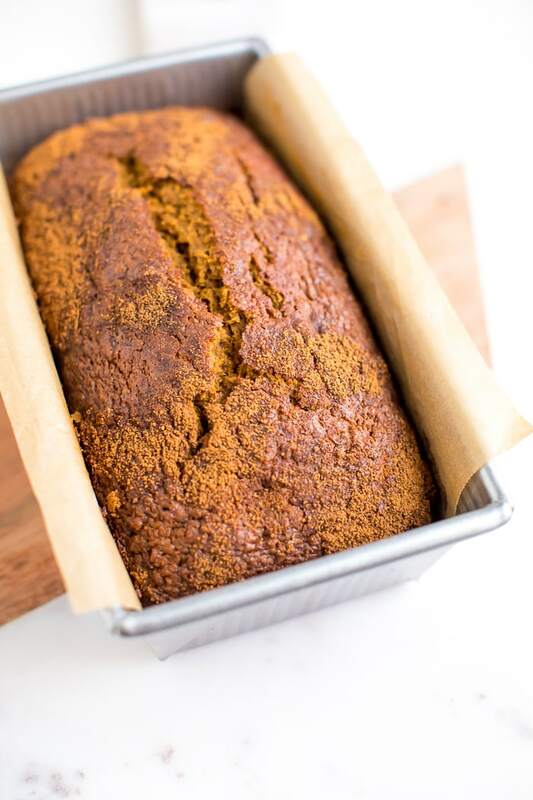 Quinoa and pumpkin bread…two of my favorite things. Perfect fall food! I saw your recipe for Southwestern Quinoa and it was all I could think about during my BodyPump class yesterday (bad that I think about food while I am working out? Oops)! I came home and made it, only changing it up in subbing cilantro for the parsley and adding a couple cloves of minced garlic. Oh, and a couple shakes of Goya Adobo with Cumin seasoning because I am obsessed with it. This recipe was SO GOOD! I brought the leftovers for lunch today. Even my mom liked it a lot, and when I cook Southwestern/Mexican, it is usually not her forte. Both of these recipes look delicious! I’m really excited to try the Southwestern Quinoa! I’m always looking to incorporate more fiber into my day and looking for creative recipes to help me do just that. Mmm, they both look so good! 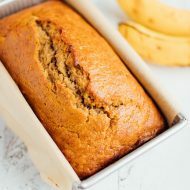 I’ve had my fair share of unhealthy pumpkin breads this season, I hope I have some time to try this one! Oh, and I LOVE your jacket. It was a spicy quinoa kind of night! I made such a similar dish last night and blogged about it! Yours is totally prettier though. I am such a fan of quinoa and its delicious versatility. We missed you at Foodbuzz, Brittany! If you’re ever in LA, let me know, okay? Both of those recipes look amazing! I just opened a can of pumpkin for a recipe using up 1 tbsp… so I was trying to think of what to do with the rest! That looks awesome! And of course I love quinoa! such a protein powerhouse! Two lovely recipes full of seasonal goodness and nutrition. Thank you for sharing these treats…and your life! Don’t you love the fall months? I hope you are having a blessed week. Thanks Monet, you are such a sweetheart! That quinoa recipe looks AMAZING! Definitely bookmarking and trying it soon! I am glad you reposted this quinoa recipe. I love quinoa but think it is best as a salad and am always on the lookout for a good quinoa salad and a carb that can sit in the fridge for a couple of days so that I can have it for lunch or dinner to mix up my meal plan. I will definately try this one. Hi Brittany, I made the pumpkin gingerbread recipe Wednesday night and it was THE HIT of Thanksgiving! My husband’s family can’t stop thinking about it and want it for Christmas too! I’m making it again tomorrow, doubling it so I can share with a new mom to share a meal. I was also going to make a big hot dish but now that I see your quinoa salad, I might just do that too…Thank you!!! I realize this is an odd question, but were there food vendors at the Montpelier races or is it all tailgate? What kind of food is available to buy? I think there are a few vendors (food carts/trucks) with food but I’ve never purchased food because we always tailgate. Hope that helps. Thank you for sharing these treats…and your life! Don’t you love the fall months? I hope you are having a blessed week. 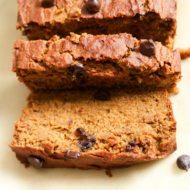 I appreciate the fact that so many people think the pumpkin bread recipe sounds great (which it does), but wish more people would write what it tasted like and adaptations for it they made. For me that would be more helpful, and encouraging me to try ip. I made this recipe today and it came out fantastic! I used a regular egg, 1/4 cup maple syrup, and no added sugar on top. The texture of the bread was great (not too dense), and the flavor of the pumpkin and spices really shines through without all the sugar overpowering it. This one is a keeper! Made it today – love it! I’m often looking for an afternoon treat that isn’t loaded with sugar. I used a regular egg too as I’m not vegan. I decided not to omit the sugar topping. Glad I didn’t – that crust was yum – and really not much extra sugar as I only used about a tablespoon. Would oat flour work if I was to use it? I haven’t tried the recipe with oat flour so I’m not 100% sure how it will turn out, but I have a feeling it will work fine. That said, I think oat flour might make it a bit more dense so you may need to add more liquid to the batter. Let me know if you try it.